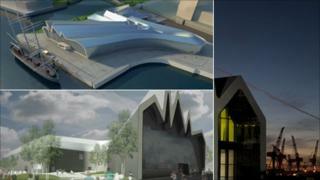 The keys to Glasgow's new Riverside Museum have been handed over to the city council now that construction work on the £74m venue has been completed. The museum, on the banks of the River Clyde, will house the city's valuable transport collection which was on display at the Kelvin Hall until April. Larger exhibits have already been put in place. Now work will start to install the remaining 3,000 objects. The museum is scheduled to open in late Spring 2011. Building contractor BAM began construction on the complex, designed by Stirling Prize-winner Zaha Hadid, in 2007. The building was formally handed over to Glasgow Museums staff on Tuesday. BAM is expected to remain on site for a few more weeks, with only landscaping, the south façade and some snagging to finish. Larger transport objects, such as subway cars, locomotives and trams, have already been installed in the museum. Smaller objects, such as cars, bikes, motorbikes and ship models, will now be transferred from the Kelvin Hall, where they have been under wraps since April. Glasgow City Council leader Gordon Matheson said: "The building itself is a feat of engineering, and BAM has done a fantastic job turning Zaha Hadid's ambitious design into what I'm sure will become one of the city's most recognisable and popular buildings." "With the Tall Ship Glenlee berthed alongside, the Riverside Museum is certain to become an iconic image of Glasgow. "It represents the city's rich and proud heritage as well as its ambitions and potential for the future." The bulk of funding for the Riverside Museum has already been committed by Glasgow City Council and the Heritage Lottery Fund. An ongoing appeal to raise the remaining £5m is close to 80% of its target.